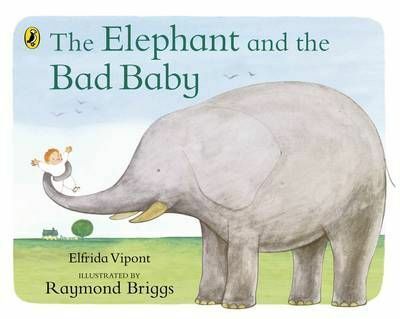 "The Elephant and the Bad Baby" is the classic story from Elfrida Vipont and Raymond Briggs. The Elephant takes the Bad Baby for a ride and they go 'rumpeta, rumpeta, rumpeta down the road.' They help themselves to ice creams, pies, buns, crisps, biscuits, lollipops and apples, and the shopkeepers follow them down the road shouting and waving. All ends well as the Bad Baby learns to say 'Please' and his mother makes pancakes for everyone. Elfrida Vipont worked as a teacher, singer and writer. She wrote over 30 books and won the Carnegie Medal in 1950 for Lark on the Wing. Raymond Briggs has produced wonderful children's books including the classic titles "The Snowman", "Father Christmas" and "When the Wind Blows" - all made into immensely successful films. Raymond lives in Sussex. Look out for these other titles by Raymond Briggs: The Snowman; The Elephant and the Bad Baby; Father Christmas; Fungus the Bogeyman; Raymond Briggs' Christmas Little Library; The Father Christmas it's a Bloomin' Terrible Joke Book; Jim and the Beanstalk; Father Christmas Goes on Holiday.